Should Christians Boycott Businesses Or Products? 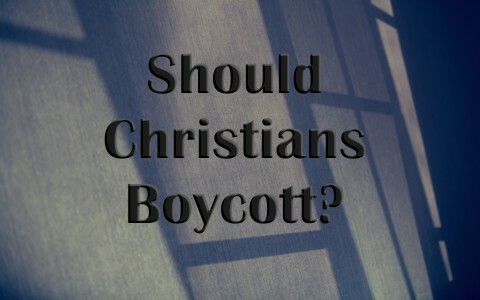 Should Christians boycott certain products or businesses for certain stands they take? The Bible doesn’t say anything about boycotting businesses or products, but it has a lot to say about obeying those who are in authority. Only when we are told to break God’s law can we break man’s law (Acts 5:29), but until that happens, “Let every person be subject to the governing authorities. For there is no authority except from God, and those that exist have been instituted by God. Therefore whoever resists the authorities resists what God has appointed, and those who resist will incur judgment” (Rom 13:1-2), because these authorities are “God’s servant for your good. But if you do wrong, be afraid, for he does not bear the sword in vain. For he is the servant of God, an avenger who carries out God’s wrath on the wrongdoer” (Rom 13:4), so “one must be in subjection, not only to avoid God’s wrath but also for the sake of conscience” (Rom 13:5). If you’re violating your own conscience, then it is sin (James 4:17). The same goes for me, so the Christian’s duty is to “Be subject for the Lord’s sake to every human institution, whether it be to the emperor as supreme, or to governors as sent by him to punish those who do evil and to praise those who do good” (1st Pet 2:13-14), and in this way, you can live a life above reproach and “put to silence the ignorance of foolish people” (1st Pet 2:15). Protesting is one thing, but when it comes to looting and the destruction of personal and public property, they are no longer protesters; they are civil terrorists. There is never any excuse for the Christian to resort to violence. The only exception would be to defend one’s own life or that of family or friends, or anyone who is your neighbor (includes everyone!). Jesus has called us to peace and to turn the other cheek if insulted. Those who blow up abortion clinics are not doing God’s work, but work of the Devil. Christians can protest abortion clinics in the hopes that they might save a life, but they are not to crossover into areas of civil disobedience, just because something’s evil. We don’t respond to evil with evil (Rom 12:17), and we strive to “live peaceably with all” (Rom 12:18). We can trust God to avenge, can’t we? Does He really need our help? Of course not, rather let us “’leave it to the wrath of God, for it is written, ‘Vengeance is mine, I will repay, says the Lord’” (Rom 12:19). Here’s how we are to react to evil; “if your enemy is hungry, feed him; if he is thirsty, give him something to drink; for by so doing you will heap burning coals on his head” (Rom 12:20). What if it is public knowledge that a certain company has been promoting anti-Christian agendas or supporting something that is condemned in God’s Word? Should we continue buying from a company that is using their profits to support something that is ungodly? Obviously we should not support anyone or anything in this world that promotes sin. That is contrary to our Christian faith as we must abstain from evil and even the appearance of it (1st Thess 5:22). There is certainly nothing wrong with boycotting products or companies for their stands on social issues, especially when they violate our own sense of right and wrong, but more importantly, when they violate biblical principles, we just cannot ignore it. It is our right to boycott a company or product that is pushing against the traditional family of the last 2,000 years, and try to redefine what marriage is, compared to what God’s Word says it is (Gen 2:21-25). Some would even argue it is our duty to make our voice heard about what some companies are promoting. We must remind ourselves, “Who do they work for?” They work for the public and to the public they must be held accountable. By buying their products, we are paying their salary, and since their profits come from us, we have a right to know how they’re using it, and what they’re spending it on. If we disagree with their agenda, there are other products we can use. We might not put an end to this evil, but we certainly won’t be funding it by buying their products or purchasing their services. God can use us to be a positive agent of change in this world. If we are the salt of the earth, then we must be sprinkled about the earth. Salt that sits in a shaker is useless. The same goes with letting our light shine before others. We don’t hide it under a basket, but neither do we shine it right in someone’s face. There is always a balanced approach to relationships, and one which we must show mutual dignity and respect for others. If you let a business know how you feel, make sure you season your words with salt, and show why you believe God’s Word is right on a certain subject. Then, you’ll have a better chance at effectual change. An abrasive, self-righteous attitude can have just the opposite effect; in fact, it can harden their hearts…and ours too if we’re not careful. Years ago a man told me he had invested in some stocks. He didn’t know every company that he had investments in because his investments were spread out over a large portfolio of companies, but when he found out that a certain company was taking advantage of a people group in South America, just for the sake of profits, he looked to see if he had stock in that company, and sure enough, he did. He immediately sold his stocks, but he let the company know the reason why. He was angry with the way the company was abusing the local population to extract a valuable resource at very little expense, and paid the local people pennies a day for the privilege of them doing all the hard work. He let them know about it…but in a dignified, respectful, yet clear manner. Eventually, the company moved out, but by then, they had ruined a large section of the forest, and left behind a scarred landscape that was barren for years. That hurt the local resident’s food supply. I would say, “Be an agent of change in this world,” and live a life that is pleasing to God, but we’re also commanded to not associate with “the sexually immoral of this world, or the greedy and swindlers, or idolaters, since then you would need to go out of the world” (1st Cor 5:10), so if we are supporting businesses that are anti-Christian by buying their products and services, we are not so much associating with them, but we are partnering with them, by funding their evil purposes. You can certainly send your protest to the company and tell them why you’re boycotting their company, but don’t violate the law of the land in doing so (Rom 3:1-5). Speak the truth…but do it in love. Something more for you to read: How Do You Know They are Christian? Next post: How Can You Start Your Own Ministry?